A lecture that traces my 20 year journey as a quilter, sharing things I've learned along the way. Digital presentation plus showing of most recent quilts. An inspirational lecture sharing insights about my evolution from traditional quilter to art quilter. Digital presentation plus recent quilts. A good design primer, this lecture shares what I've learned about composition and design over the years. Digital presentation plus recent quilts. 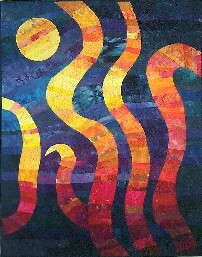 Instruction will inspire your creativity and enable you to produce original works of art in the quilt medium. Instruction and exercises in colour as well as the elements and principles of design and composition will give you the background to make visually dynamic work. Explore the process of dyeing your own fabric, the techniques you might need to construct the work itself, and how to finish it off. Learn how to create a pattern for your original design and discover seat of the pants construction methods. You will have the opportunity to complete two small works. 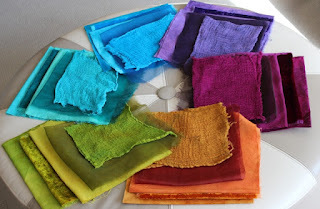 Are you “dyeing” to try your hand at the many ways to use dyes on cloth? If you’ve been feeling a little unsure or intimidated by the many processes, then let Elaine guide you. All processes in this class involve the use of Procion MX Fibre Reactive dyes for natural fibres. Fabric dyeing requires far less space than painting fabric and never changes the hand of the fabric. Topics include low-water immersion and parfait dyeing, shibori (bound, pole-wrapped & stitch-resist)) soy wax batik, flour paste resist, dye painting, and discharge. You will have the chance to dye cotton, silk and silk/rayon velvet. The title of this class says it all! Don’t miss this fun and information-packed class! 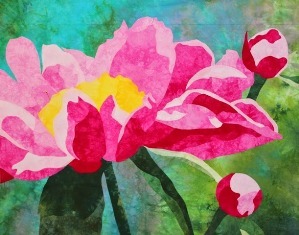 Create a beautiful art quilt featuring your favourite flower or foliage. Learn to turn a close-up botanical photograph into a pattern suitable for creating a fused art quilt. Instruction will include how to select a suitable photograph and choose the best layout. Instruction will address value and how to create depth through the use of value contrasts. Learn how to build the flower or foliage and then attach it to a suitable background, as well as how to quilt the completed design. Please note that any day of this five-day class can be scheduled as a one-day class. See One and Two Day Classes for descriptions and photos of the one-day classes. Classes included are Reflections, Improv Curves, Flip and Sew Curves, Liberated Strip Piecing, and Liberated Radial Piecing. In this very hands-on class, you will be introduced to a different method of free-hand cutting and piecing each morning. The instructor will also show samples and options for each method. You will work for the rest of the day cutting and sewing, with guidance available from the instructor. This class is all about free and serendipitous quilts. Minimal use of rulers, measurements, and pinning! Each morning students are invited to post works from the previous day for feedback and discussion. "Uncommon” = above the ordinary, exceptional, remarkable. "Unforgettable" = memorable and not to be forgotten. 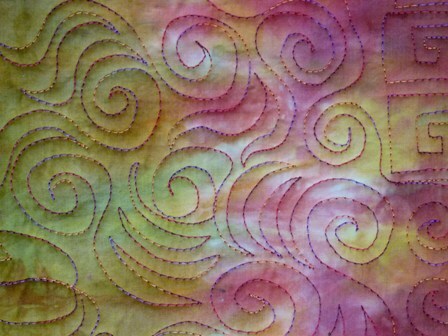 Discover many wonderful ways you can use both commercial and hand-dyed threads in your quilts. Lighter weight threads can be used through the needle, heavier ones for bobbin work, couching, and even some textured hand-stitching. Dye some luscious threads to increase your options and add to your stash. Then try some thread sketching, a little thread painting, some machine quilting, and a little couching and bobbin work. Learn when to use a stabilizer and/or a hoop, how to master any type of thread, what needles to use, and how to get your sewing machine to cooperate. 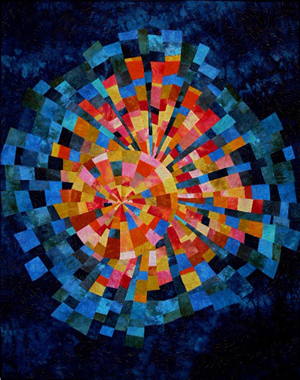 Gain new skills that will make your quilts uncommon and unforgettable. Most processes will require a reliable sewing machine with the ability to drop or cover the feed dogs. INSPIRED BY NATURE, DESIGNED BY YOU! Create a beautiful botanical art quilt featuring your favorite flower, foliage or tree. Learn to turn a close-up photograph into a pattern suitable for creating a fused art quilt. Instruction will include how to select a suitable photograph and choose the best composition. You will learn about value and how to create depth through the use of value contrasts. Learn how to build your botanical design and then attach it to a suitable background. THE CLASS THAT MANY OF YOU HAVE ASKED FOR IS HERE!!! 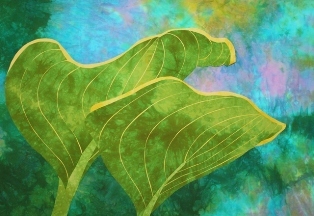 In this one-day class students will learn Elaine’s method of layered appliqué to create a pair or trio of hosta leaves. Two different patterns are available to choose from at a cost of $16 each: Hosta Duo or Hosta Trio. There is also an option of purchasing a hand-dyed kit of fabric. No sewing machine required for this class. Is there anyone who doesn't love a gnarled mature tree with all that textured bark? Learn how I create my collage trees, while using one of my patterns and a photo as your reference (pattern & photo $12.00). Learn to see value and represent depth. In the one day class you will learn how to collage a tree using one of my patterns and a photo as your reference. 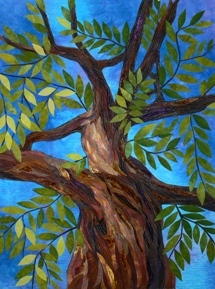 In the two-day class please bring a photo of your favourite tree, and you will learn how to create your own basic pattern and then fill in your tree with collage. Please visit the Tree Gallery of my website. Pattern choices are Standing Still, Branching Out, or Vagabond Song. No sewing machine required for this class. In the one day class students will work with one of the instructor's patterns to create a stunning quilt with depth and dimension. Learn to see value. 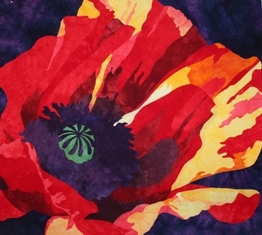 Instructor will also explain and demonstrate how she turns her close-up floral photographs into a pattern suitable for creating a fused wall quilt. Two different patterns will be available for sale at a cost of $16 each (Peony in pink or Sun-kissed Poppy in red or blue). 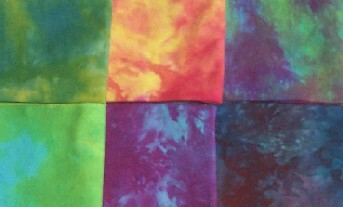 There is also an option of purchasing a hand-dyed kit of fabric. 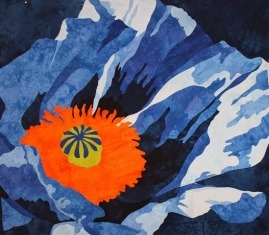 In the two day class students can design their own floral quilt based on their own photograph. No sewing machine required for one or two day class as you will need classroom time for building your flower. Creating an improv piece is a lot of fun, but sometimes we want a bit more control over the outcome of the design. Come with a photograph that features colours, shapes or lines that inspire you, and bring fabrics in those colours. Bring a notebook, pencil and eraser to sketch some rough designs (no you don’t need to know how to draw). You will learn to cut curves free-hand using a rotary cutter and mat (no ruler!). See how easy it is to sew these curves together into a loosely-planned improv design. You will learn how to piece in a few design elements inspired by your photograph and rough sketches. Liberate yourself from the shackles of precision piecing and fly by the seat of your pants! Cut this quilt entirely free-hand without a ruler and learn to piece it together without squaring your blocks. Then we'll talk about designing with these wonky blocks. Enjoy a day of free expression. 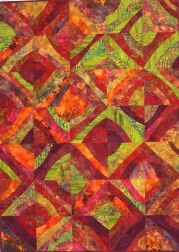 This quilt is all about gorgeous, luscious colour and cutting free-hand! The only measuring you will need to do is to cut your original squares of fabric and to square up your blocks at the end. You will learn how to cut blocks free-hand and mix them up. Love serendipity? Then this is the quilt for you. Just begin with a feeling of the colours you want and prepare to be surprised and delighted. There are many ways you can turn these blocks for a variety of looks and designs. Can be used as a background or as a design unto itself. Full day class: Create a fun and curvaceous quilt, either from your own design or use one of the instructor's patterns (a pair of bold Femmes Fatales OR an abstract Aurora Moon landscape). 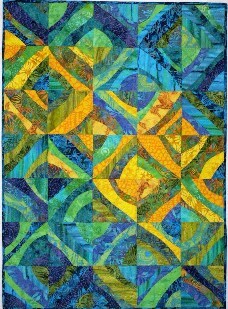 Instructor will assist students who wish to design their own pattern. While creating this piece, you will learn all about the flip and sew technique for creating curves built on a foundation of muslin. Great for using up those leftover strips and scraps. Patterns available for $8.00 each. Prerequisite: The ability to free-motion stipple quilt by machine. Are you in a stippling rut? Expand your repertoire of beautiful free-motion stitches! This course is designed for machine quilters who are familiar with free-motion stipple quilting, but need creative ideas to venture beyond stippling. You will take home samples of at least 20 free-motion designs that you learn in this course, including various meanderings, swirls, nested designs, leaves, flowers, and organic designs. Experiment with cotton, rayon and metallic threads. The best thing about this method of quilting is that there is no need to mark your quilt top, and nothing to wash off after. 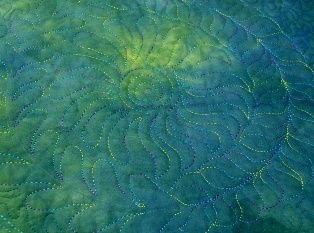 Prerequisite: Beyond Stippling, Part I, or extensive experience free-motion quilting a wide variety of motifs. Are you ready to take your free-motion machine quilting to even greater heights? Expand your repertoire of beautiful free-motion stitches even further! This course is designed for machine quilters who have taken my Beyond Stippling Part I class, and are comfortable moving ahead with more complex designs. You will take home samples of at least 20 more free-motion designs that you learn in this course, and we will study free-motion feathers in depth. Time will also be devoted to learning how to combine motifs. This course is an introduction to low-water immersion dying using Procion MX fibre reactive dyes for natural fibers. Learn the basics of dyeing and the secret to my saturated colours while dyeing a 12-step colour wheel using only three parent dye colours, and then producing 4 fat quarters of multi-coloured fabric. Students will take home 16 fat quarters (total 4 meters) of dyed fabric. Instructions will be provided on rinsing and washing at home. Supply fee. PREREQUSITE: Elaine's Introduction to Fabric Dyeing or some experience with fabric dyeing. 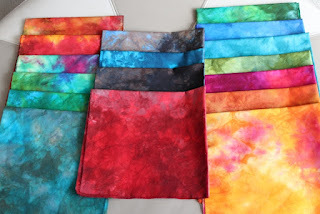 In this class, Elaine will share several methods she uses to produce her wonderful multi-coloured hand-dyed fabrics, and will walk you though the many colour combinations she typically uses. You will leave class with 16 fat quarters of cotton in a variety of multi-coloured combinations. You will also have the opportunity to dye small amounts of a variety of specialty fabrics, such as silk/rayon velvet, silk dupioni, silk organza and cheesecloth. Instructions will be provided on rinsing and washing at home. Supply fee. Take your machine quilting to a new level! 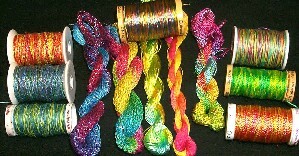 Produce beautiful rainbow variegated hand-dyed threads. Many of these threads can be stitched through a Topstitch needle, but some are too thick to pass through a needle and can be used in the bobbin for "bobbin drawing" (stitching is done from the back side) or can be couched to the front of the quilt. Threads will be prepared and dyed in class. A demo and detailed instructions will be provided for rinsing and transferring thread to spools/bobbins at home. 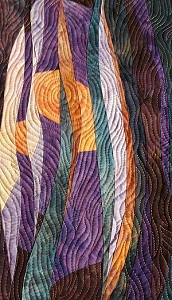 Instructor will also demonstrate and provide instructions on how these threads can be used for machine quilting. Supply fee.